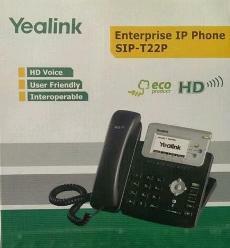 The Yealink T22P is a high quality business class IP Phone that is part of the Yealink T2 series. This model offers high definition (HD) voice quality and access to a wide array of telephony features at an extremely competitive price point. This model was tested with both a 3CX Phone System and FreePBX solution. The following serves as comprehensive review of the device including general setup information, technical specifications and important reference documents. For a relatively low price, this 3 line phone has enough regular features to meet the demands for just about any business without any distracting frills. Generally, the phone is very easy to provision with most systems, some of which even have setup templates to quickly auto provision the phone when connected to a network. A feature that stands out is the very accessible multiple account feature that is useful for using the phone with different systems, or simply applying a secondary configuration (e.g. extension.) For our evaluation, we had one account tied to one PBX and another associated with an entirely different system, each using a unique SIP trunk provider. A push of a button is all that is required to switch between accounts for calling. Both on-net (internal) and off-net (external) calls were crystal clear. The handset has a nice contour resting well in your palm or wedged between your ear and shoulder. A jack is available to connect a headset to the device. The phone is PoE capable, helping decongest power strips around the office. If purchasing a phone without a power supply, quality adapters can be typically purchased for about $10. There are relatively few negative aspects to this phone, and those that do exist are minor. The few annoyances with device may be mildly annoying for someone new to VoIP. The online console is easy to navigate but the description for some items are either too brief or thick with jargon. Fortunately, most will not spend a lot of time in the web administration area. Navigating through the menus can be a little cumbersome, especially when trying to troubleshoot, as there is no option to remember or bypass the phone password. Typing is much like texting used to be before Smartphones arrived, and for some reason, the device's default type setting is lower case letters. Thankfully, it only takes a couple presses of a button to select a better input method. Some PBX systems install their own graphics that intermittently flash on the LCD after certain provisioning scenarios. Some of the display items, such as the account name that appears when selecting which account to use when placing a call, does not reflect the label name or user name set for the account. Neither of these options can be changed. For the price, the phone is a great deal, costing less than $90 from most retailers. Easy to setup and simple to operate for the end user. Basic extra options such as headset connectivity and 3 easily accessible accounts make the phone quite versatile. Device is PoE capable and is available for purchase with or without a power supply. Any problems with the phone are relatively minor as the phone is very easy to setup and use. For the price, the integration capabilities make this phone a good, no nonsense calling solution for small business to large enterprises. Quick Start Guide and Quick Installation guide. Media loaded with the user manual and guides mentioned above. The T22P deck, handset and connecting cord. Stand works as wall mount bracket as well as desktop. May or may not include power supply. 1x Phone Cord to connect handset to main case. 1x Phone stand for using on the desktop. Depending on your system or provider, setting up the phone will be a little different, but fortunately any method you choose will be relatively simply. The following methods should work for most providers and we will briefly look at three different setup scenarios that assume that the device connects to the same LAN as your system. This may be the most cumbersome way to setup the device but even so, it is still simple. By default, the menu option is assigned to the right-most button on the main screen. From here, you can access the settings menu then the main configuration area under advanced settings. Activation - This toggles the account functionality on and off. Set it to enable for use. Label - The label for the first account appears on the main menu. Display Name - Appears on caller ID during calls depending on your PBX configuration settings. Register Name - This authenticates the account with your PBX system or ITSP. User Name - Another authentication item for associating the account with a system or ITSP. Password - This is the password associated with the extension or user, depending on the provider. 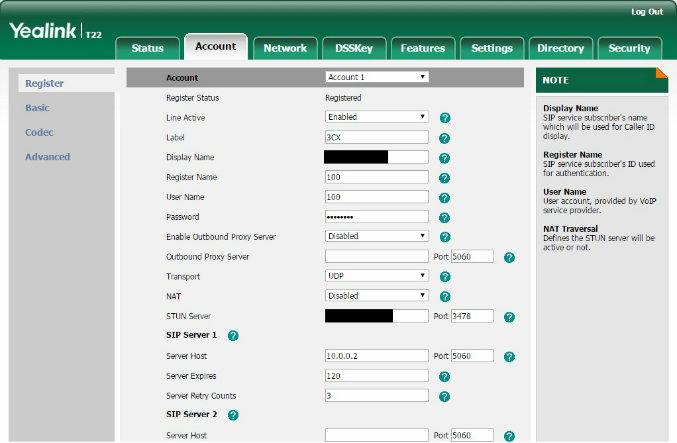 SIP Server 1 - The local IP address of your PBX or outside provider. SIP Server 2 - A secondary PBX location. Usually used for failover, if available. Outbound Status - If the phone connects to a system from outside the LAN, this is where the feature is enabled. STUN Status - If traversing a firewall, a STUN server may be necessary as NAT does not always play well with VoIP. STUN Server - The IP address of the STUN server. Auto Answer - Enable this if you want the phone to automatically answer calls. After inputting the correct settings, press button below "SAVE" and the device will configure. If successful, the word "Registered" will appear next to the account name. To access the web console, open a browser window from a computer on the LAN and type in the IP address of the device. The default user name and password are both "admin". After entering this information you can program the phone. Here you will input the exact same information as described in step one. Just make sure to select the "Confirm" button at the bottom of the page. Many systems will have a feature to auto provision detected phones on the LAN with needed settings over the network. Some will have this feature available directly from the interface and others will provide a web address for the phone to access a config file that can be input under the Advance Settings Menu in option 9. Below is a screenshot from the 3CX Management Console. Phones on the network appear in the Phone menu. Existing phones have the option to "Reset and Re-provision" while new phones have the option "Provision". After a minute or so, the phone is ready to use. For the price, features and easy setup options, the Yealink T22P IP Phone is a great choice for most businesses. 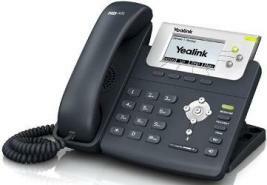 Yealink T22P reviews are listed in chronological order. We've purchased a whole office of yealink phones and a Yeastar MyPBX phone system. I did a lot of research. The phones are easy to configure and connect to the system. They work very well. Lots of featurs, great operability. Very reliable. I highly recommend Yealink and Yeastar products. I am happy with the performance of my Yealink T-22. For me, a relatively active phone user (inbound sales), I found the characters and placement of the information on the LCD screen to be well placed and easy to read. It is easy for me to handle multiple calls, put one on hold, pick up another and transfer...etc. I also like the ability to easily toggle through missed calls. Buttons have good feel and handset has a good weight in my hand.